We’d love your help. Let us know what’s wrong with this preview of Faceless by Joshua Bader. Even if being a personal wizard to a powerful CEO has its perks, Colin Fisher’s body and soul have paid for these benefits with every case. From stopping a crime spree by a demon pact wizard to killing a relentless ice demon, he's been on the job. Yet he still doesn’t know what happened to his fiancée on the n The Race is on to Save Colin and Bring Him Back from the Beyond. To ask other readers questions about Faceless, please sign up. 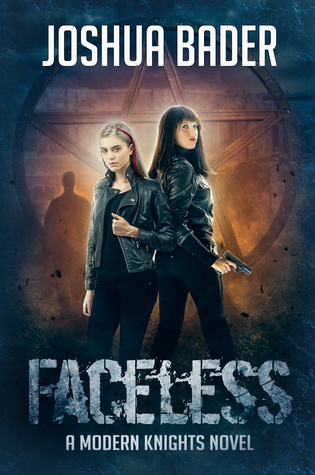 An action-packed urban fantasy, “Faceless” is the third book in the “Modern Knights” series. Colin Fisher is a wizard and is the personal wizard to a powerful CEO. He has been busy with this skill from stopping a demon pact wizard to killing a relentless ice demon, but he still has one thing outstanding - what happened to his fiancee after he gained his magic? Now he has to pay his highest price ever as he tries to peel back layers of time and solve an enigma - problem is if he does do that he may never wake up from his current coma. Battling to keep him safe are two woman who both love Colin Fisher is a wizard and is the personal wizard to a powerful CEO. He has been busy with this skill from stopping a demon pact wizard to killing a relentless ice demon, but he still has one thing outstanding - what happened to his fiancee after he gained his magic? Now he has to pay his highest price ever as he tries to peel back layers of time and solve an enigma - problem is if he does do that he may never wake up from his current coma. Battling to keep him safe are two woman who both love him - a demon blooded assassin called Veruca Wakefield and an FBI Agent called Andrea Deveraux - however can these love rivals work together to save Colin? Kindle Unlimited - Thank you! Delivery boy, psychologist, retired vagabond wizard, and father of three. I read and write all manner of speculative fiction, but have an especially deep love of urban fantasy.